In the context of her 40th anniversary, La Centrale was motivated to organize this conference to mark the parallel historical proximity of the creation of the centre in the early 1970’s to the emergence of feminist performance art. Three guest speakers from Montreal, as well as an international scholar will address- from their respective critical points of view- historical and contemporary issues related to the practice of performance in art, as well as the intersections of feminist issues and contemporary politics. 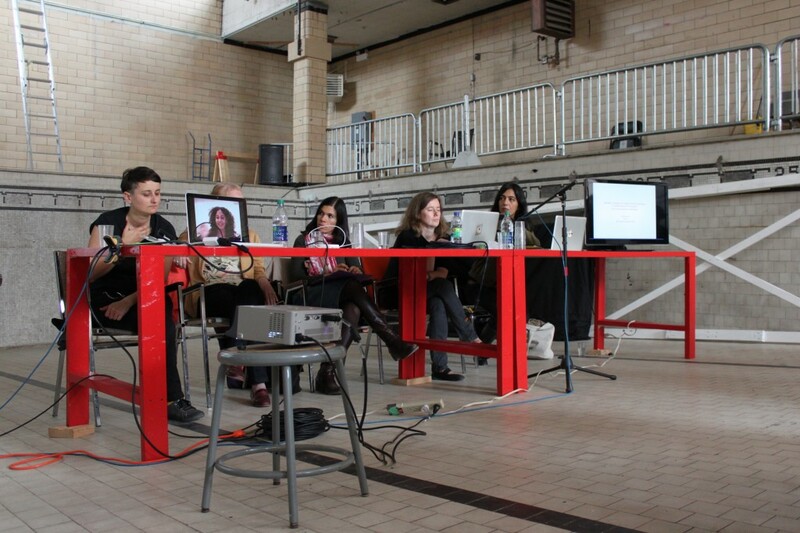 This conference will take place at Bain Saint Michel, where three performance artists invited by La Centrale – Victoria Stanton, Teresa Maria Diaz Nerio and Celeste Marie Welch – will perform during VIVA!. Together, the artistic and discursive programming will offer new perspectives on the history of feminist performance art, as well as the major political and artistic upheavals that have influenced, and continue to influence, the disciplines its related discourses. Thérèse St-Gelais is a professor at UQAM, where she teaches contemporary art history and women’s contributions to the visual arts. She was curator of the Ghada Amer exhibition (Musée d’art contemporain de Montréal) and authored the accompanying catalogue text. She has written and edited texts for “Loin des yeux près du corps. Entre theory et creation” (exhibition at la Galerie de l’UQAM) and “L’indécidable. Écarts et déplacements de l’art actuel.” She also co-organized (with Marie-Ève Charron and Marie-Josée Lafortune) the exhibition Archi-féministes ! Contemporary art historian, Elvan Zabunyan, is associate professor at l’Université Rennes 2 and an art critic. Her research specializes in the last 40 years of North American contemporary art, with a specific focus on the 1970’s shift towards racial and feminist concerns. Since the early 90’s, she has been working on questions that stem from cultural studies, postcolonial theories, and gender studies, while trying to construct- through critical thought- a contemporary art history methodology that is articulated around cultural, social and political histories. She published “Black is a color, a history of African American art,” co-edited numerous books, and has written a number of articles in collective publications, exhibition catalogues and periodicals. Her most recent work “Theresa Hak Kyung Cha – Berkeley – 1968,” was published by Presses du réel (2013). Barbara Clausen is a curator and art historian. She is a professor for the history and theory of performance art at the art history department at the Université du Québec à Montréal (UQAM). Clausen writes extensively on performance art and performative curatorial practices and has curated numerous exhibitions, performance series and film programs in Europe and the North America. In 2012 she curated the performance and lecture series “Something to Say, Something to Do” followed by the first retrospective of the french-american filmmaker and artist “Babette Mangolte” in 2013, both at VOX, centre d’art contemporain, in Montréal. She is currently working on the exhibition and performance series “STAGE SET STAGE” at the SBC gallery for contemporary art in Montréal for 2013/2014.